Welcome to my Culinary blog ! I have been dreaming of doing this for the past several years, and have just now, found the time for myself, to carve out this little niche’ to share with the world of fellow foodies, domestic Goddesses’ ( and Gods! too). I’m also hoping this appeals to my fellow foodies who just want to share their culinary passions, thoughts, and photos with the world, same way I love to!. Back in the day ( early 90’s) I actually owned 5 restaurants, 4 in Evergreen, CO, and 1 in Ambergris Caye, Belize. I also owned 2 catering companies, and was a Food and Beverage manager for a couple of places on Ambergris Caye, BZ. I LOVE the industry. One day, I may get back into it..but for now, I am simply enjoying my own little kitchen. The past few years, my career path changed a bit ( for financial reasons), and I was completely unable to use my talents in this arena where I was. That being said, I was able to travel the world, and make due with the limited creative kitchen time, and here I am. I love to be CREATIVE, and COOK, dine out, review restaurants, AND, the BEST part…I photograph all of these things, and share them, to make you salivate ;-). I have had the most incredible few years, as my job allowed me month long leave time, which granted me full “carte blanche” to rent some AMAZING ~”P-Diddy”~ pimpin villas, (which I am compiling a list of – with photos!!) that included AMAZING gourmet kitchens. I have done this for the past 5 years, all over the world. Reason being, I CRAVED a “home” environment, as opposed to a resort type leave. I did this, every 4-6 months, so we had an awesome spacious place that our friends and family could come join us, during our down time. MOST IMPORTANTLY, I found these perfect rental spaces, with the BEST kitchens, so I could COOK for my family, friends, and anyone else who turned up on our doorstep for the month ;-). I am so excited to finally HAVE this venue, in which to launch all my thousands ( no exaggeration!!) of uber cool, diverse, ethnic, healthy, “not so healthy”, incredibly satisfying recipes, from all over this beautiful world. I also will be starting a forum, and a place for ALL to share recipes, suggestions, and photos as well as a lot of uber helpful, resourceful, and creative “Kitchen Tips” (in a section that I will be creating shortly). I have been doing temp set up kitchens around this world, while I was unable to have my own, so needless to say, I GOT this, down pat..We are currently “based” in San Benito beach, Mexico (on the Yucatan), until we permanently relocate to Australia. I will then, (hopefully) have my sheeoz together -to do some tutorial vlogs, showing some of the really cool things I have learned along the way. I have formally deemed myself “The Culinary Goddess”. Haters, if you are gonna hate, it is sad..but I AM, and you would know it the moment you met me, from the PASSION I have, just picking out produce, to setting up my prep area, to even singing while doing the dishes.. This title I PROUDLY accept, and wear proudly, as cooking, and creating anything beautiful with food, including presentation, taste, serving, venue, etc is a true description for “Bliss” for me.. The picture, (of me, above) in one of the SEVERAL international kitchens ,that I have had the pleasure of creating amazing things in ! 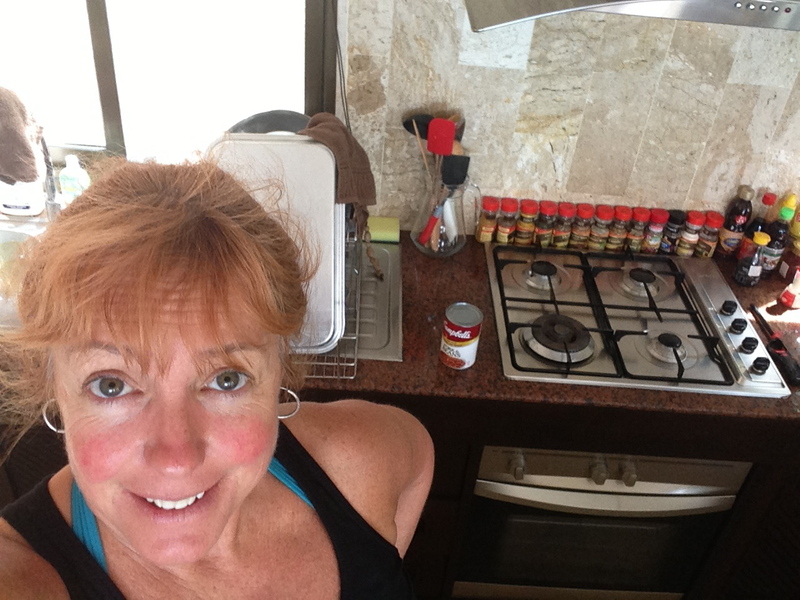 This kitchen.. was AWESOME in Villa Taling Nagm, in Koh Samui, Thailand. BEST place to serve my man dinner, bar none. This is so marvelous, Corinne Isabella! I will follow you devotedly!